Brenda, a call centre agent for a large insurance company, was 23 years old when she donated. She is delighted that something done on a whim has resulted in a personal satisfaction she could never have imagined. The youngest of eight children from a village in Mpumalanga, South Africa, she is the only member of her family who has ever donated blood and she is the first black South African to become an unrelated stem cell donor. “It is not typical of black South African culture to donate blood, let alone do something like become a stem cell donor”, says Brenda. The HLA typings of all SABMR donors are listed on a worldwide database called Bone Marrow Donors Worldwide. It was this search tool that was used by the transplant co-ordinators in the USA to identify a potential donor in South Africa. The fact that Brenda donated stem cells for a young girl in Lancaster, California, is all the more extraordinary because of several obstacles that could have prevented the donation from ever occurring. Following her registration, Brenda changed jobs and cell phone numbers. The contact numbers the registry had were no longer valid. On a whim, and serendipitously, Brenda telephoned her previous boss. “We had a good relationship, but had not remained in contact. One day, I decided to pick up the phone and make a greeting. I was surprised to learn from him that the bone marrow registry was attempting to locate me. If I had not called, they would have never reached me.” Brenda contacted the registry and confirmed her willingness to participate, but it would be some time before the recipient required a bone marrow transplant. The SABMR responded to the preliminary search request on 6 September 2000. On 7 September 2000, further testing was requested by the USA Transplant Centre, and this was completed in 12 days – well within expected time frame of 21 days. Samples for mandatory confirmatory typing in line with international norms, were requested for shipment to the USA on 20 September 2000 and were shipped within 3 days. On 18 October 2000, the SABMR was informed that Brenda was the donor of choice. The patient was at that time in remission and the SABMR was asked to keep Brenda “on hold”. For more than two years, there was no news from the USA, other than to confirm that the patient was doing well and continued requests to “please keep the donor on hold”. In March 2003, the SABMR was asked to establish Brenda’s availability as ‘her’ patient had relapsed and urgently needed a bone marrow transplant. By this time there was another obstacle to manage. Brenda had given birth to a daughter six months earlier. Fortunately for the patient, the medical opinion was that Brenda had recovered sufficiently to donate stem cells. 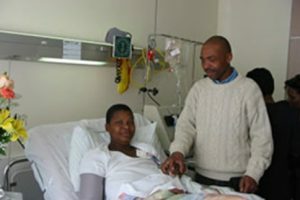 Finally, on 26 May 2003, Brenda became the first black South African to donate stem cells to an unrelated patient. Brenda was supported during her donation by her partner, Raymond. The donor-companion plays a very important role in ensuring the donor is comfortable during the donation. The donor-companion accompanies the donor to the collection facility to provide moral and, sometimes, physical support. “It was a big deal because it was the first stem cell donation performed at that clinic in Johannesburg and the staff was so excited” says Brenda. And while she admits she was nervous, she says the procedure was very easy. In 2004, the SABMR was asked by the City of Hope Hospital in the USA, to convey to Brenda an invitation to attend their “Celebration of Life” meeting. At this meeting, Brenda would come face-to-face with the patient. The SABMR policy on donor-recipient contact has since been reviewed. In line with international trends donor – recipient contact is no longer permitted. The main reasons being concern that donors may be pressurised into providing additional stem cell products as well as the emotional aspects such as morbid attachment or coming to terms with the death of the patient. Brenda was delighted to accept the invitation. The trip was her first trip out of South Africa. It was an extraordinary journey for a young woman who simply followed through on a whim. “You never know how your actions will come back to you” she said, with joyful disbelief.